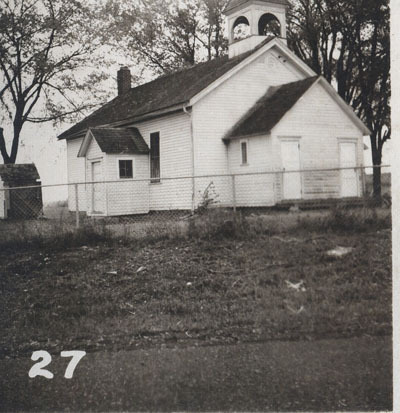 The Woodbury School in 1954. GENERAL LOCATION 6 miles southwest of St. Paul near Woodbury. MODERN ADDRESS located at Old Afton Rd. and Courtly. DISTRICT BOUNDARIES The border with Ramsey County marked the western boundary and the district stretched about 3 miles to the east in the southwestern region of the state. Before 1869: First school was the parsonage of the German M.E. church and some private homes. 1873: New school built, replaces old one. There was no pump at the school. Water was carried from the neighboring farm. According to the Rural School News, The Gille School studied much about Indian life, and even had pow-wows. Until 1910 each teacher had 30-40 students. It declined afterwards so that later only one teacher was needed. Enrollment: 1898: 62. 1899: 51. 1938-25. 1939: 24. There were two rooms in the newer school building, which allowed the district to split grades and have two teachers. It was the only school in the area that had two teachers. Other teachers: C.E. Rose, W.C. Doyle, George Pilgrim, H.J. Bebermeyer, Mrs. Homberg, Margaret Funk, Clara Kernkamp Mahle, Covena Bach, Esther Baab, Jeanette Garbe Schilling, Clara Bach, Sarah Bothe, Laura Mahle Kernkamp, Annie McHattie, Rose Kruse, Gertrude Austin Bielenberg.